David’s quest into energy self-sufficiency started when he and his wife built their off-grid home in 2004. At first, they struggled and cobbled together a bare-bones system. It worked but they slowly upgraded with more modern components to meet their needs as they evolved. Today, their system has morphed into a hybrid on grid/off grid system to meet the challenge of young children! David’s experiences give him the expertise to design a system tailored to your lifestyle and help you skip the pitfalls. For legacy systems, he can recommend the right upgrades having lived through them. Off-grid, grid-connected, hybrid, DIY, or totally hands-off; the modern equipment allows us to build a system that matches your personal level of involvement. David has been in the construction industry for 18 years. 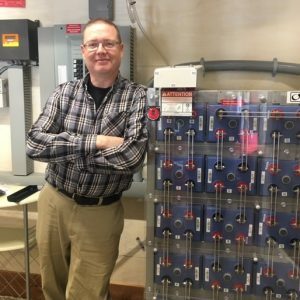 A journeyman carpenter with a passion for efficient building and energy self-sufficiency, his lifelong interest in electronics and solar help with the technical end of your system’s design.